Volcanoes of the Deep Sea reveals the astounding sights that lie 12,000 feet below the surface of the ocean, while delivering a real-life tale of mystery as scientists search for an animal that may be one of Earth’s greatest survivors—an ancient species that is decorating the deep sea floor with its strange hexagonal trademark. In pursuit of this elusive animal and an understanding of its mysterious habitat, the film propels audiences from the dramatic sea cliffs of Spain, through two oceans, into deep-sea sites dense with astounding life forms and even into the far reaches of space. Produced by: The Stephen Low Company / Volcanic Ocean Films Inc.
Volcanoes of the Deep Sea represents a unique opportunity for students and educators to explore one of the great frontiers of science and some of the world’s most extraordinary habitats. See and download the companion Teacher’s Guide for Volcanoes of the Deep Sea. > Click arrow to advance. Click on image to open full-size gallery. 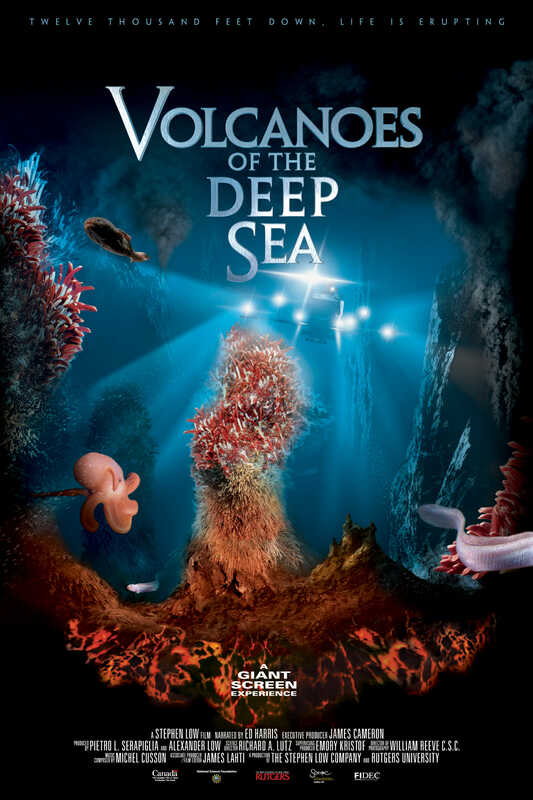 It took nearly ten years to bring Volcanoes of the Deep Sea to the screen, but it was worth the wait to do it right. 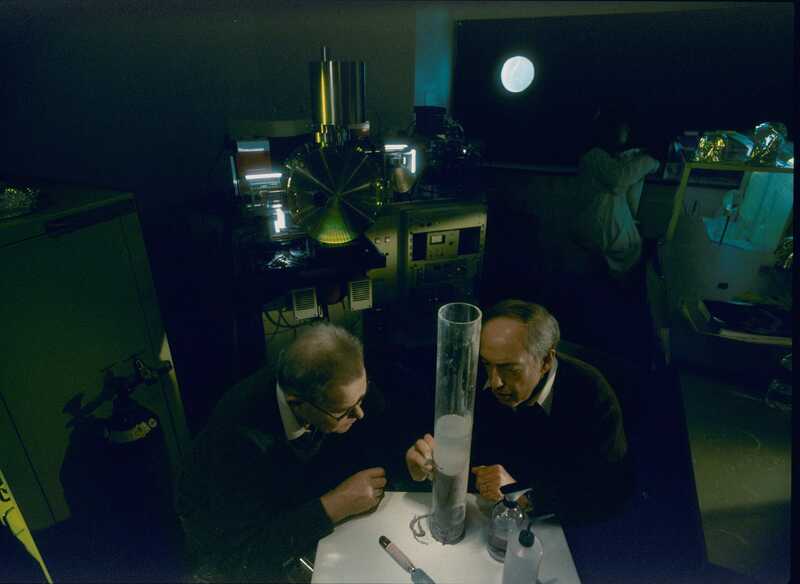 During those years, Low and his team worked closely with members of the deep-sea science and exploration community to develop the project and create a method to light the ocean far superior to anything ever before used. 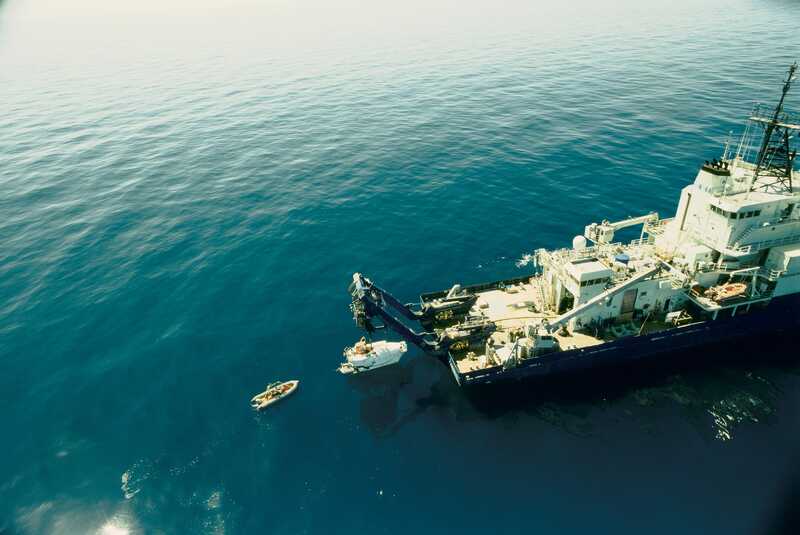 It was a unique partnership with Rutgers University and leading deep-sea scientists working at the institution that ultimately made the venture possible. Rutgers biologist Dr. Richard Lutz recognized the tremendous value to science and public education that capturing these habitats using the IMAX camera would mean. Although scientists videotape vents on a regular basis as part of their research, no one had been able to light and record these habitats at any significant resolution and scale. In 1999, with a series of dives scheduled at a deep-sea vent site Lutz was studying, the group saw a window of opportunity…and took the plunge. 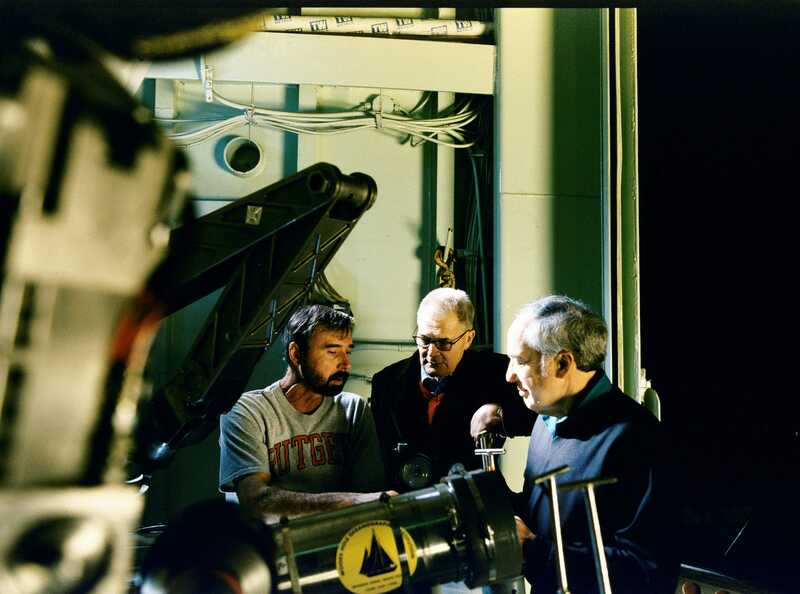 With some funding in place from the National Science Foundation and investment by The Stephen Low Company, the team began shooting in late 1999, testing a new lighting array and camera configuration on the deep sea submersible Alvin. The test took place during an expedition to a deep-sea vent site known as 9°North, located in the Pacific in 9,000 feet of water. Filming during four dives to the bottom proved that not only was a giant-screen film going to be possible, it was going to be breathtaking. “It was great,” says Alvin pilot Bruce Strickrott. “Here we are with all these lights and we can see twice as far as normal.” Alexander Low, a producer on the project enthused that the footage “exceeded the team’s expectations.” The dives also revealed new findings chronicled in National Geographic Magazine (February 2003 and October 2000) and American Scientist. 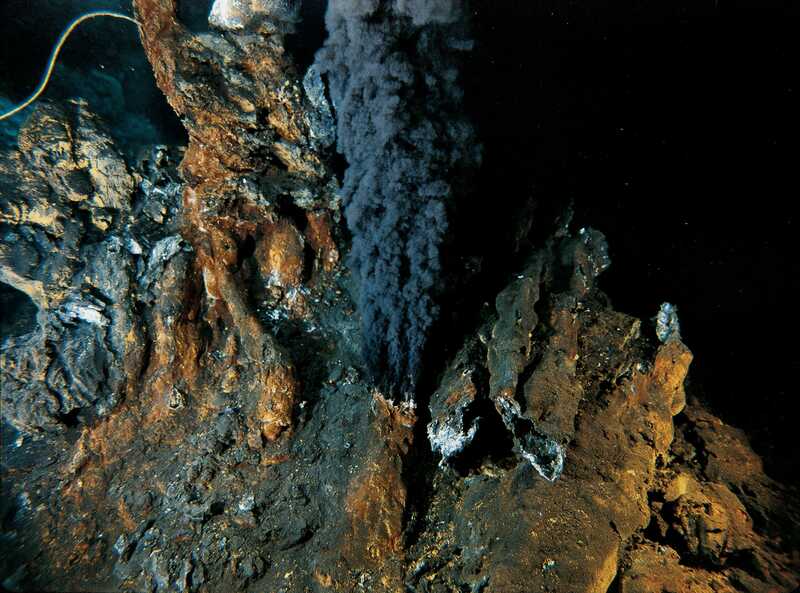 Volcanoes of the Deep Sea was on its way to becoming a reality. 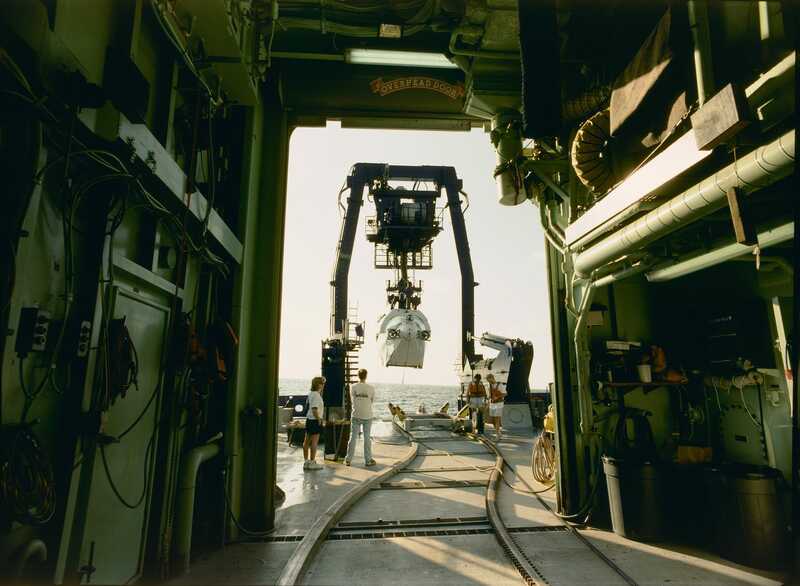 With the help of Rutgers University, major funding from the National Science Foundation, and support from science centers, the project amassed a $7.0 Million USD budget (plus an extra million dollars worth of dive time on the submersible Alvin) and production began in earnest. One of the keys to getting the film right was lighting — no surprise, given that the deep ocean is pitch black. Titanica pioneered the use of HMI lights underwater, offering the best views yet of the ocean floor. After screening a pre-release version, director James Cameron was impressed enough to use the same type of array to help light his Oscar-winning epic on the same subject. Cameron was to become an early investor in Volcanoes of the Deep Sea. As impressive as Titanica was, Volcanoes of the Deep Sea shines even more light — 4,400 watts — out much farther into the water. Fast forward to August 4, 2001. The research vessel Atlantis pulls out of the Azores. Owned by the US Navy and operated by Woods Hole, the 274-foot (83 meter) Atlantis can chug halfway around the world before needing a break. 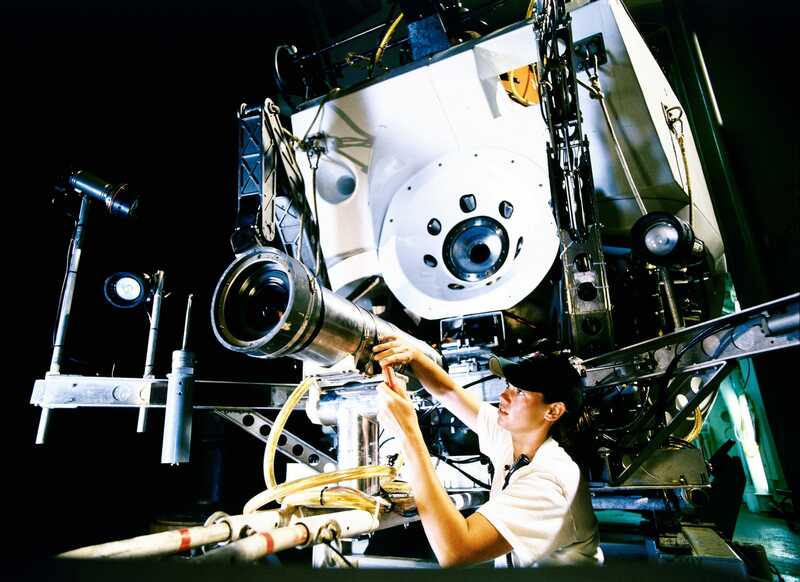 It carries the film production crew, scientists, and Alvin, modified to accommodate the 200-pound IMAX camera. Also along on the month-long cruise are six members of the film’s education outreach program — a testament to the importance of education in the project. Flying Blind. Alvin normally operates with one pilot and two scientific observers. But for Volcanoes of the Deep Sea the IMAX camera sits in the pilot’s seat. The pilot steers from the starboard observer’s seat while watching several video feeds. Chief Alvin pilot BLee Williams, who has nearly 300 dives under his belt, says the experience was disorienting at first. “I wasn’t using all my normal senses… What didn’t work was my idea to stand behind the camera and cameraman, lean over them both and look past the IMAX lens out the pilot’s viewport… I quickly went back to looking out the side window and watching the video.” Not only is the pilot flying blind, the cinematographer has to work with no assistant. “It’s a bit improvisational. On Alvin we have to do our own loading. So we’re down there shooting and loading and pulling focus and f-stops all at once — which is a real challenge,” explains Low. Despite bumping into a few walls and coming to within a yard of 752° Fahrenheit (400° Celsius) vent fluids, Alvin escaped the shoots unscathed, except for the odd little mishap. “Occasionally the booms with the lights would bump into things and that would stretch some of the components — we’d have to fix them at night,” says Strickrott. At the heart of Volcanoes of the Deep Sea are hydrothermal vents—communities of life thriving in the most extreme environment on Earth. 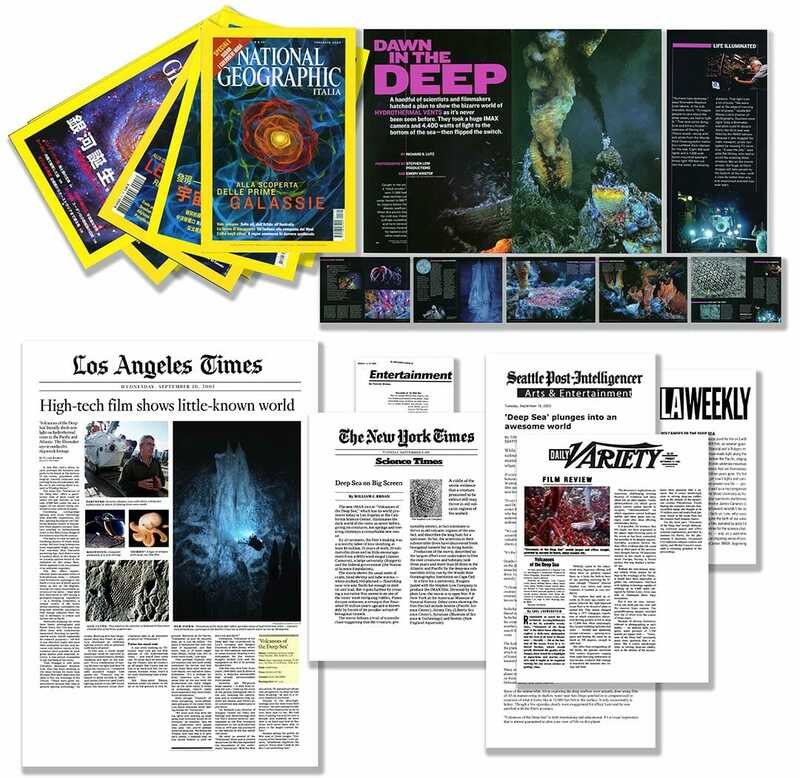 Scientific investigation of deep-sea vents has yielded astounding discoveries, opened up important new avenues for science and begun to transform our understanding of life on this planet, and on others. Among the discoveries: Dense communities of creatures fueled not by sunlight, but by Earth’s own heat and chemistry, Microbes that thrive in water hot enough to boil a lobster, Keys to the origin and evolution of life on Earth, Organisms that have survived essentially unchanged through tens of millions of years of turbulent planetary history. The Volcanoes of the Deep Sea giant screen experience is an immersive introduction to this fantastic world of discovery. 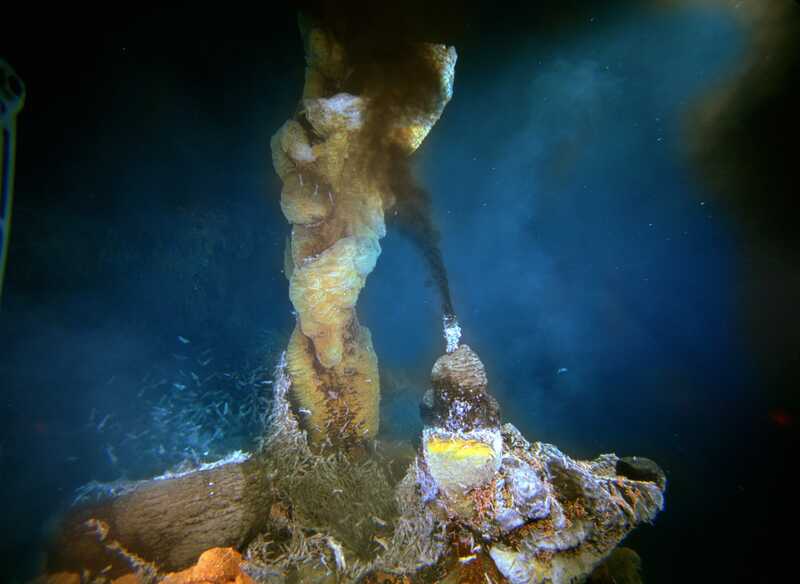 The film delivers the first extensively lit views of vent habitats ever seen by the public. (Even scientists at the leading edge of vent research are seeing this environment as they have never seen it before). The film also tracks a real scientific investigation, following scientists as they unravel the mystery of the Paleodictyon—a modern link to Earth’s ancient oceans. Poisonous Gardens. The vents seem like an unlikely place to look for life. Rutgers biologist Dr. Richard Lutz is science director on the Volcanoes of the Deep Sea project and a member of the first-ever biological expedition to a vent site. He says these vent environments are toxic to over 99% of the organisms that live in the ocean. ” But in these “poisonous gardens,” as filmmaker Low dubs them, live some of the most extraordinary creatures on the planet. If life can flourish here, then maybe it can exist almost anywhere. Water in the vents, heated by magma below the crust, is heavily populated by microbes. They form the basis of a unique food chain, one driven by Earth’s internal heat and chemistry rather than sunlight. Finding dazzling communities of creatures living in an ecosystem that doesn’t rely on sunlight has overturned fundamental assumptions about the origins of life. There is even evidence suggesting that life on Earth may have originated in the vents. Volcanoes of the Deep Sea focuses on one particular dive — a plunge to a volcanic ridge located more than two miles down in the middle of the Atlantic. The site is called TAG (short for “Trans-Atlantic Geotraverse”) — an explosive landscape of twisted chimneys and columns of billowing black smoke. Here, millions of tiny shrimp jockey for position near sulfur-rich emissions pouring from chimneys shaped like something out of a Dr. Seuss tale. At TAG, Volcanoes of the Deep Sea delves into the mystery of life’s survival in toxic, volcanic environments and engages audiences in the search for one of the planet’s most ancient and elusive species. 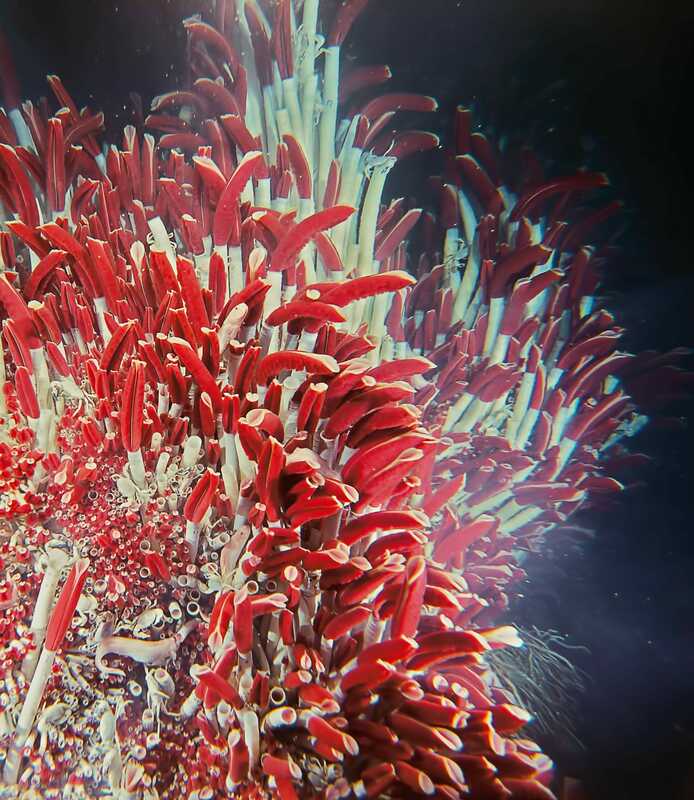 To unravel the mystery of the vents, the film transports audiences to a variety of different locations, including 9° North, a Pacific vent site where giant tubeworms — six-foot (1.8 meter)-tall white creatures with blood-red tips — stand in graceful, dense clusters. Porcelain white crabs pick their way around and over them, while eerie, eel-like zoarcid fish hover and hunt. The sites are like no other place on Earth. The mid-ocean ridge. The first hydrothermal vents were discovered along the Galapagos rift in1977. They have since been found in the Atlantic, Indian and Arctic oceans. 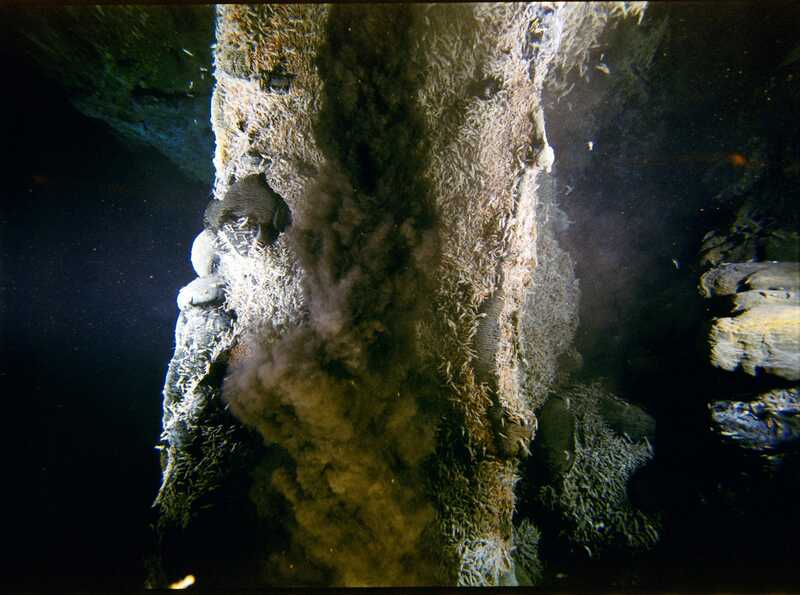 The vent sites featured in the film have a vital connection: they are all located on the mid-ocean ridge, a mountainous, volcanically active cleft in the earth’s crust that snakes through the depths of the world’s oceans. At roughly 40,000 miles (64,400 km) in length, this globe-encircling formation is the world’s longest mountain chain. Paleodictyon, ancient mystery of the deep. 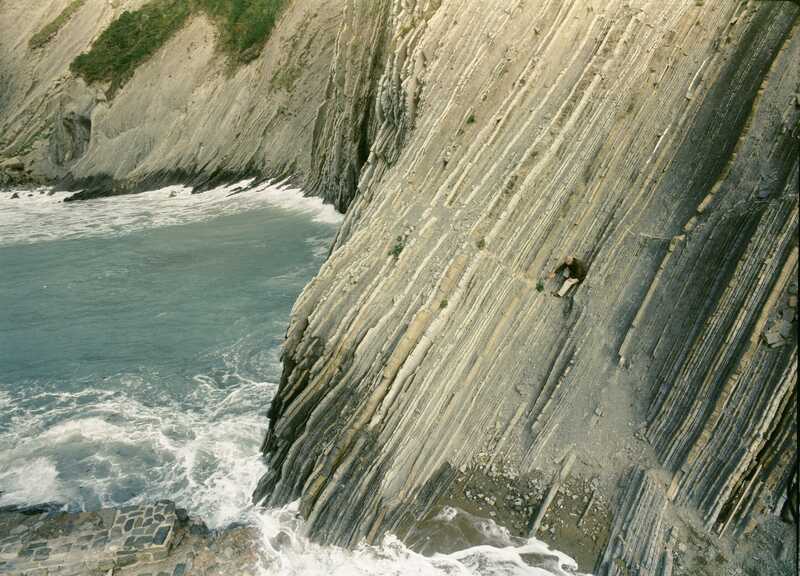 Volcanoes of the Deep Sea takes the audience to the coast of Spain where a unique hexagonal fossil pattern is being recovered from the rugged cliffs by eminent German geologist and paleontologist Dr. Dolf Seilacher. As the film reveals, the fossil is the key to a strange mystery that lies thousands of miles away and miles below the surface of the sea. 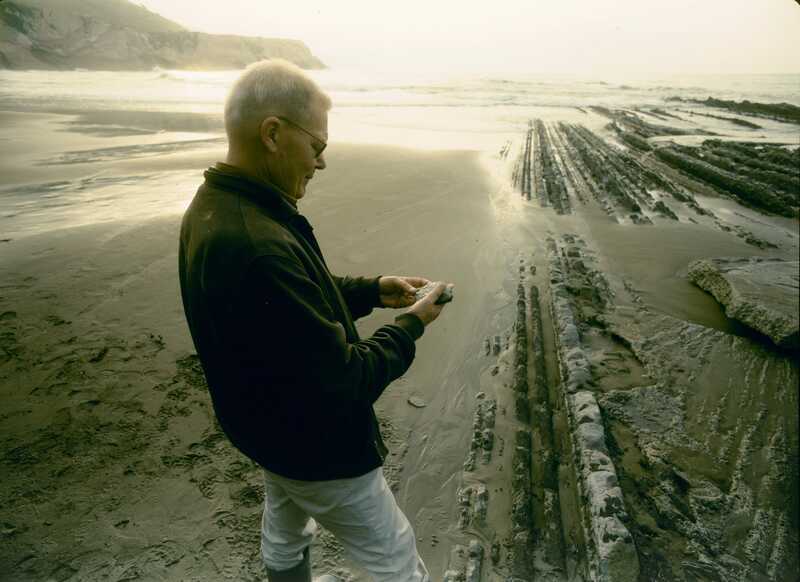 It was in the Mid-Atlantic in 1976 that Rutgers marine geologist Dr. Peter Rona first spied strange geometric patterns on the ocean floor. 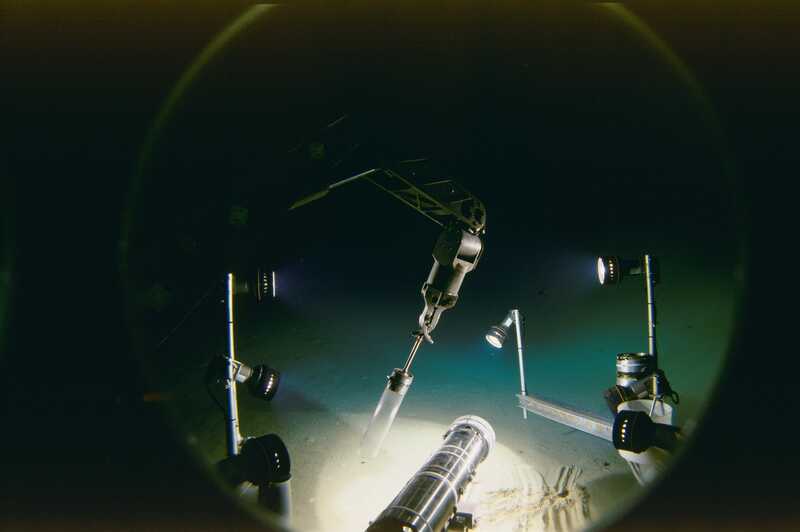 The discovery was made with a remotely- towed camera scanning sediment some 12,000 feet (3700 meters) below the surface. Each poker-chip-sized hexagonal imprint was pockmarked with several hundred tiny holes laid out symmetrically, giving it the look of an otherworldly Chinese Checkers board. 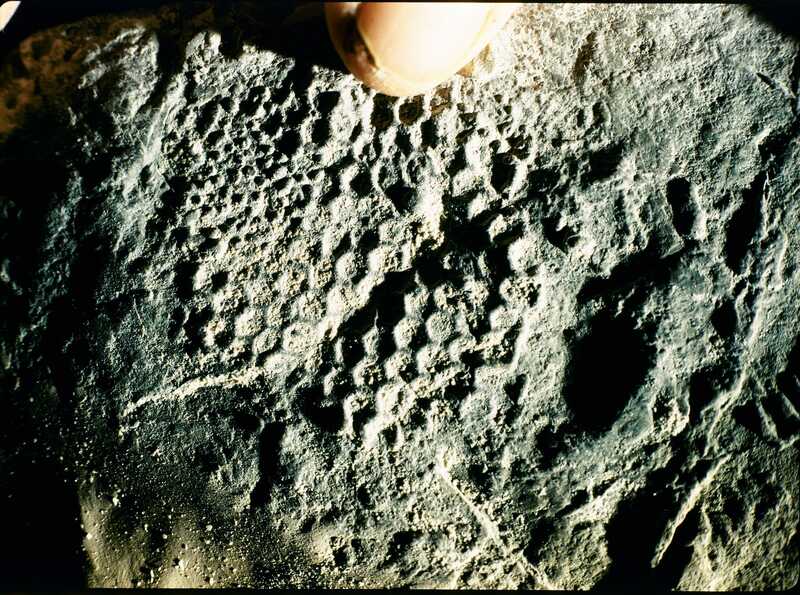 The holes, freshly made in the sediment, appeared to be the work of a tiny creature. Rona’s find soon caught the eye of Seilacher. 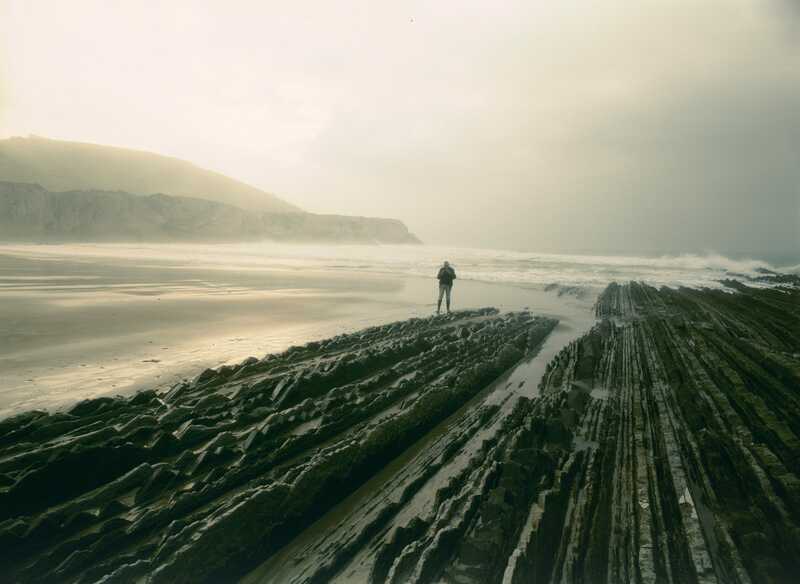 Rona recalls an excited Seilacher telling him the discovery on the ocean floor was “virtually identical to the fossil form Paleodictyon that he had described seeing in ancient sediments.” Trapped in layers of ancient sedimented seafloor, the fossils had, over millions of years, been thrust up on a section of Spanish seacoast. 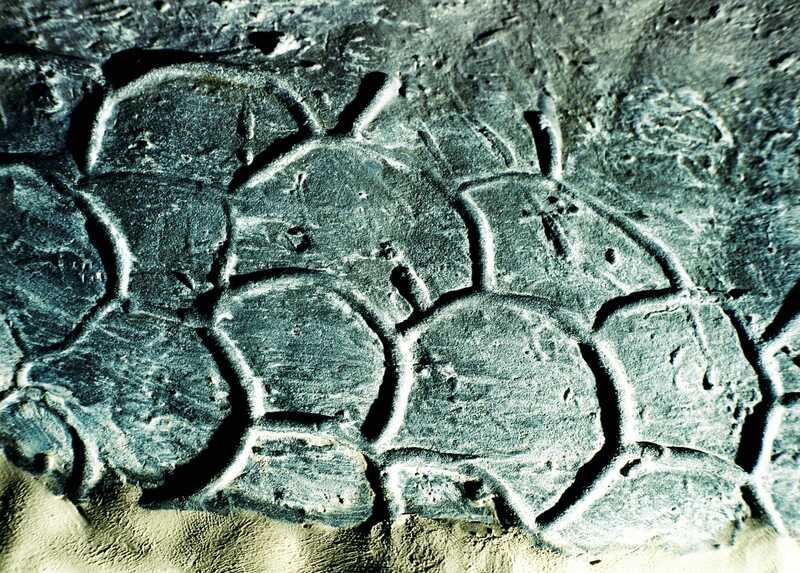 The fossils preserve, in intricate detail, the hexagonal pattern of tunnels that underlie the holes first spotted by Peter Rona on the floor of the Atlantic. What are hydrothermal vents? 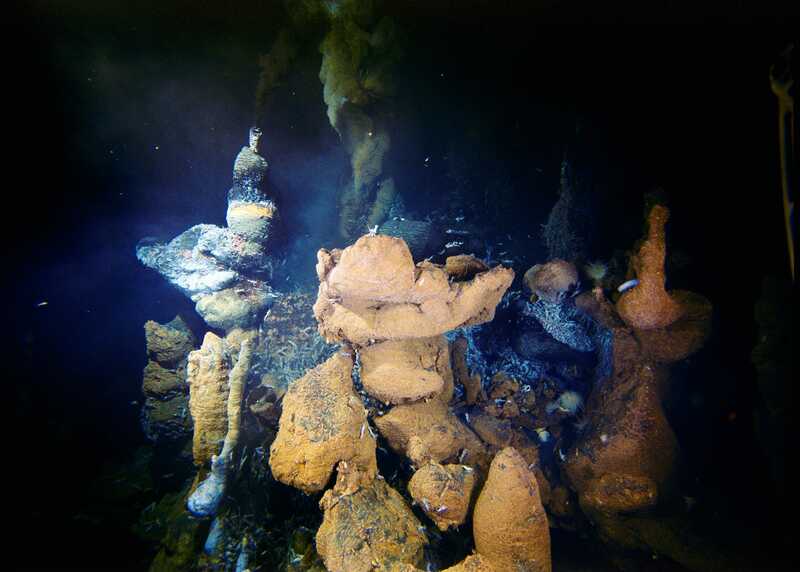 Hydrothermal vents are the key to some of the most extreme and exciting ecosystems on Earth. The Earth’s crust – a thin layer of rock floating on softer underlying rocks – is always on the move. Massive plates shift, slip under one another and pull apart. The world’s highest rate of volcanic activity lies along the Mid-Ocean Ridge, an underwater mountain range that circles the globe like a huge zipper. Here, the ocean floor is spreading as lava emerges up from the depths and cools, creating new crust. At these points, magma – melted rock – lies close to the seafloor. Seawater seeps down through cracks in the ocean floor and is superheated by contact with the hot rocks and magma. This super hot water then shoots back up into the ocean and discharges through an opening in the crust: a vent. When were the vents discovered and where are they located? The first vents were discovered in 1977, at the Galàpagos Rift, near the Galàpagos Islands in the Pacific. 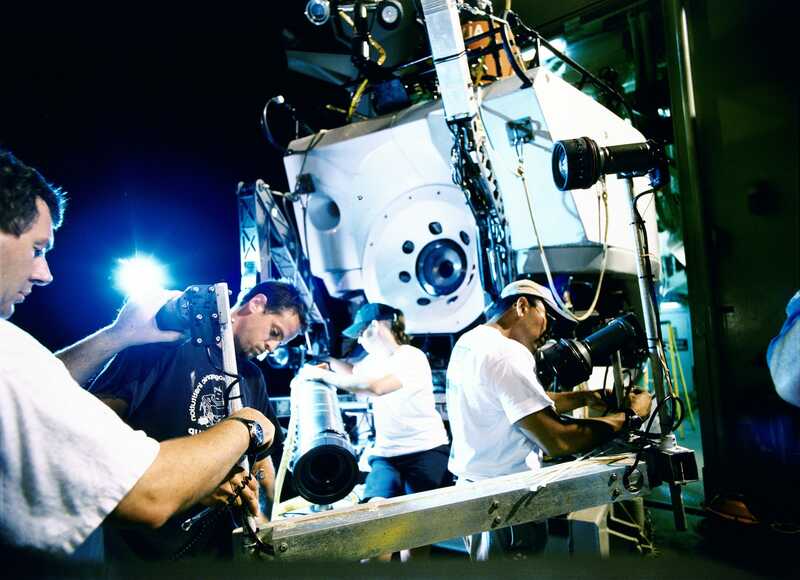 A team of geologists went down to a depth of 8,250 feet (2,515 meters) in the 3-person submersible Alvin (the same sub used by the Volcanoes of the Deep Sea crew). Here, they found water far warmer than they had expected, and a stunning array of life forms. Once abundant life forms were found at the vents, biologists organized an expedition to study them. 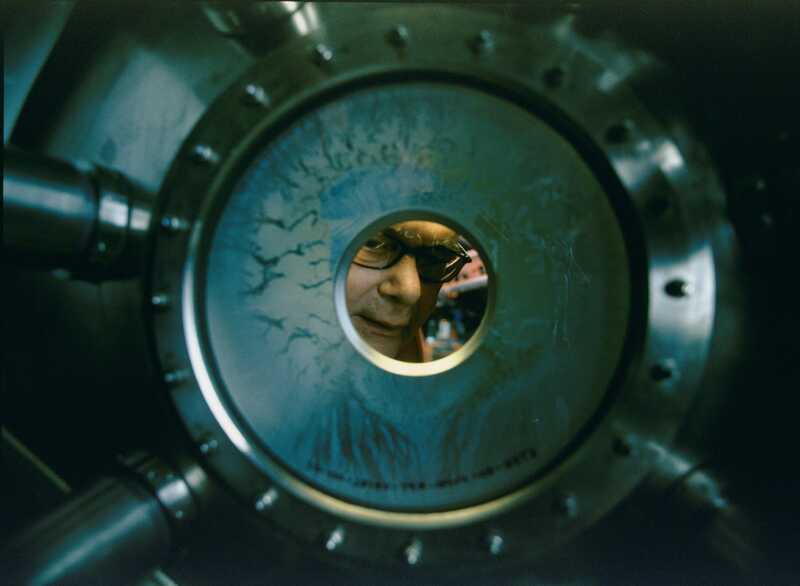 One of the members of that team was Dr. Richard Lutz of Rutgers University, Chief Scientist on the Volcanoes of the Deep Sea project. 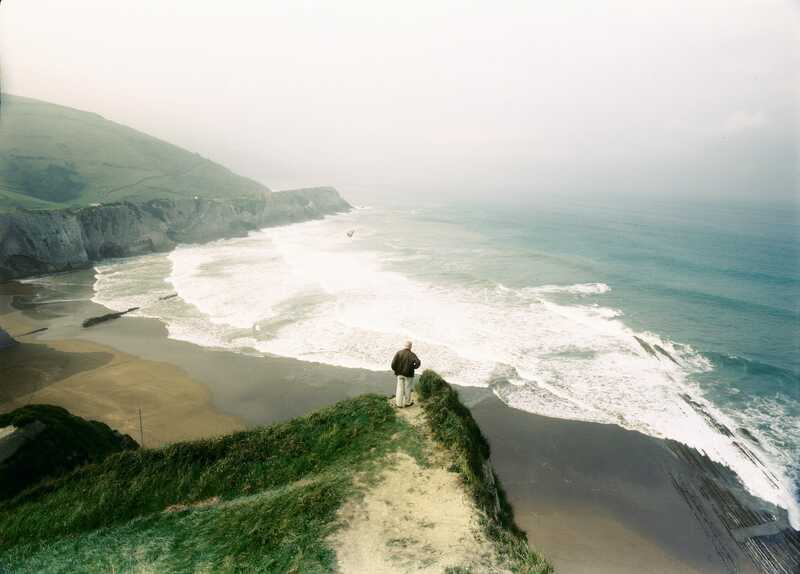 In 1985, Dr. Peter Rona, Associate Science Director for the film, led an exploration in the Atlantic, which led to the discovery of the first black smokers and associated new life forms outside of the Pacific. Until that time, it was believed that such hot springs could only occur in the more volcanically active Pacific Ocean. Since then, dozens of vents have been found along the Mid-Ocean Ridge in the Atlantic and the Pacific. They are now believed to exist in all of the world’s oceans. Are there many different kinds of vents? Yes, there are. Black smokers are perhaps the most impressive. 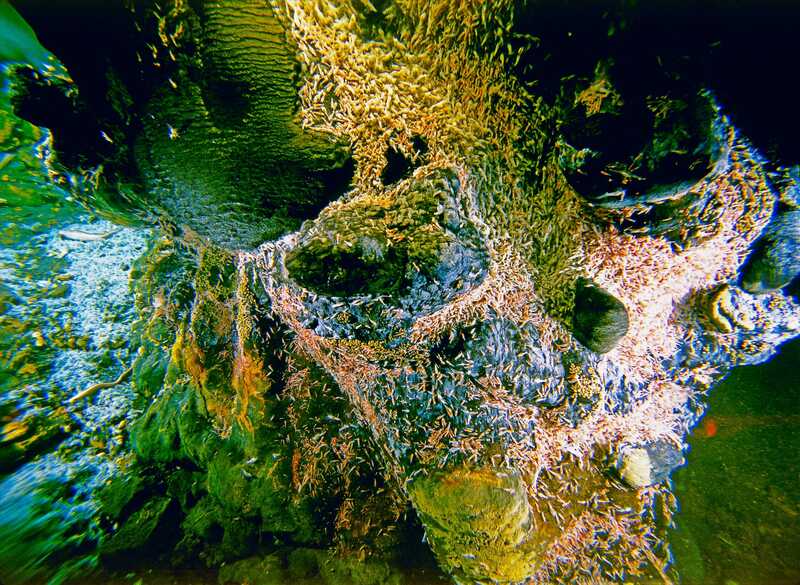 These underwater chimneys spew out huge black plumes. Though we call them smokers, the black clouds pouring from them are not actually made of smoke. Instead, they consist of dissolved minerals precipitating as they come into contact with the near-freezing ocean water. Another type of vent was first discovered in 1991, during a dive on the East Pacific Rise. Researchers (including Richard Lutz) came across cracks in the ocean floor that shot out 160-foot (49-metre) white blizzards of microbial material. The team dubbed these amazing sites “snowblowers.” They are a hint of the astounding amount of microbial life supported by heat in the Earth’s crust. An extraordinary feature of vents is the speed at which geological processes occur. Biologist and Volcanoes of the Deep Sea Science Director Richard Lutz did a Pacific dive in 1991 at 9°N, a site that had clearly just experienced a catastrophic volcanic eruption. 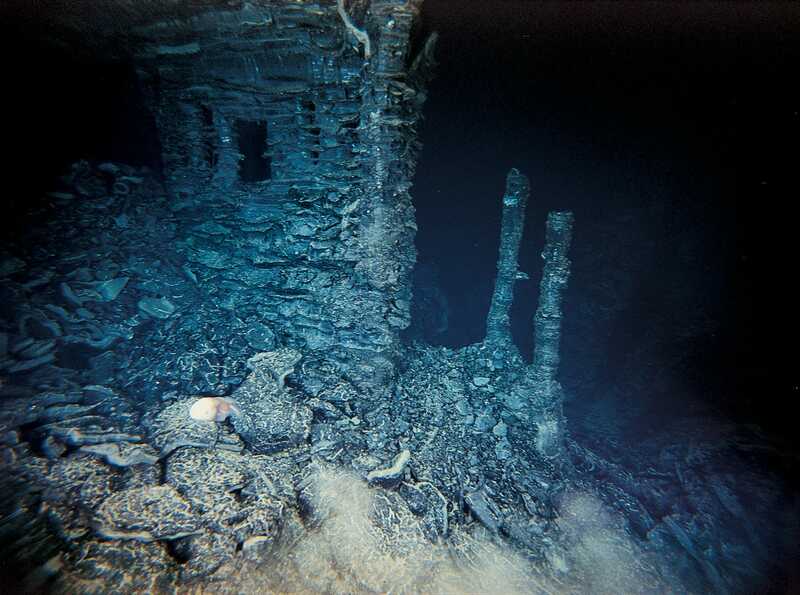 Three years later, at the same site, Lutz found a huge chimney that had risen 33 feet (10 meters) from the ocean floor in that short period of time. Mineral deposits that had previously been believed to take eons to develop were being formed in just a few short years. The ecosystem is also a treasure of valuable metals including gold. Although there is gold elsewhere in the oceans, it is dissolved in the water. 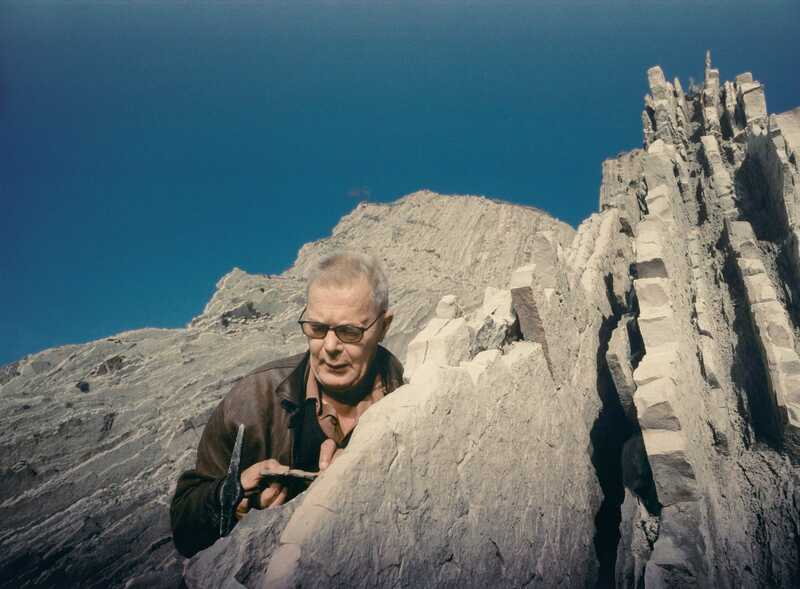 Until recently it was thought that there were no actual gold deposits in the deep, until Peter Rona and his colleagues found gold at the TAG vent site. How are the vent ecosystems different from the rest of the deep ocean? The vents are unlike any other region on the planet. Humans have tended to think of the deep ocean as a vast, empty plain too deep to support life. And it’s true that much of the depths are desert-like. 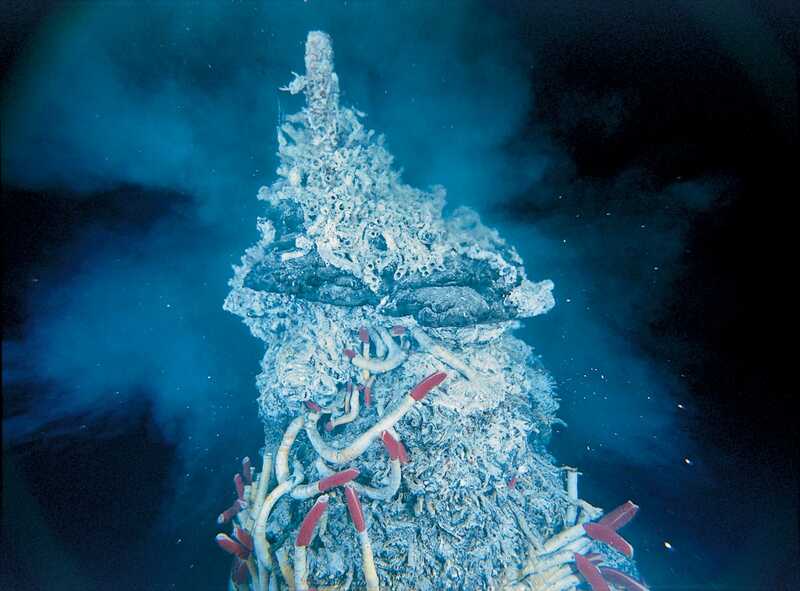 That’s one reason scientists were shocked to find vent sites – even at depths greater than 12,000 feet – absolutely loaded with life. The shock came not only from the depth, but from finding life in an environment that we once would have thought to be completely hostile to its development. For one thing, sunlight is completely absent. Then there’s the temperature. Through most of the deep ocean, water temperature is relatively stable at 35.6° Fahrenheit (2° Celsius). But the water and chemicals spewing from vents can reach 752° Fahrenheit (400° Celsius). This vent fluid is largely made up of hydrogen sulfide — a deadly poison to most creatures. Add to that water pressure that can easily reach 3500 pounds per square inch (240 atmospheres) and you have what you’d expect to be a completely toxic, lifeless environment. Lutz says that if the vent environment existed on land, it “would resemble a toxic-waste site.” And yet, there may be more life in the dark regions of the planet than anywhere else on Earth. A wealth of microbes lives right in and around the vents. Nobody knows how far down they go – but some scientists believe that the biomass (the combined weight) of these microbes and those living throughout the Earth’s crust, may be greater than the biomass of every other living thing on Earth. Perhaps the most radical difference between this ecosystem and those found elsewhere on the planet is that it is based, not on photosynthesis, but on chemosynthesis. What is chemosynthesis? The rock surfaces near vents and the water around them are absolutely loaded with bacteria. What sets them apart is that they use energy from chemicals dissolved in the hot springs, instead of sunlight, to produce food. In other words, they use chemosynthesis rather than photosynthesis. On land, in fresh water and in the not-so-deep ocean, the key to life is photosynthesis. Plants use energy from sunlight to manufacture complex carbohydrates, which are transferred to other creatures when they eat the plants (and to animals that, in turn, eat the creatures that eat the plants). In the ocean, plankton found near the surface serves the same purpose, using energy from sunlight to manufacture food for other creatures. But the deep ocean is different. Here, without sunlight, there can be no photosynthesis. Instead, bacteria take energy from hydrogen sulfide and manufacture complex carbohydrates from carbon, oxygen and hydrogen present in the seawater. 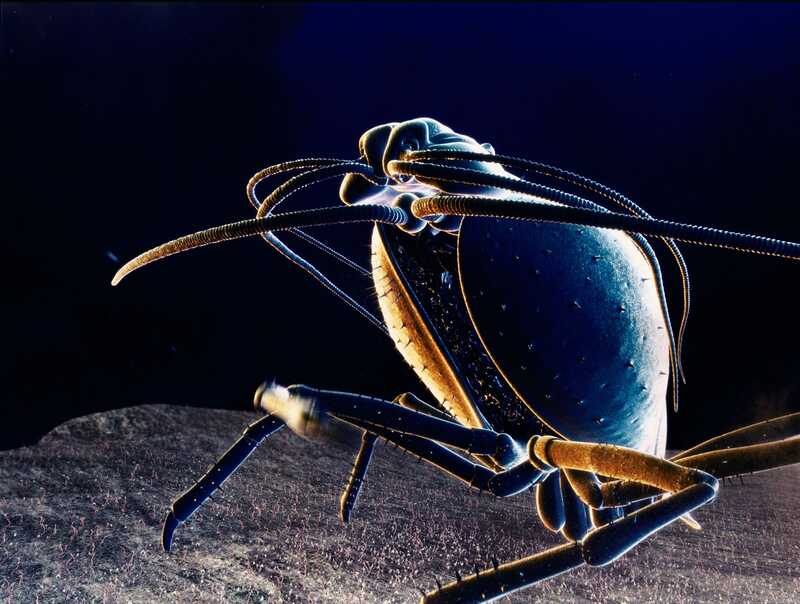 Other animals, like crabs, eat the bacteria, and these creatures are, in turn, eaten by others. A complex web of food relationships comes into being – one based entirely on the conversion of chemicals, not sunlight, into food. Because the vent sites are so rich in hydrogen sulfide, they are absolutely loaded with bacteria – and that’s why life is so rich here. What kinds of creatures live near the vents? When the first scientists to see a vent saw giant clams littering the ocean floor, they imagined that these mollusks must have come from elsewhere – dropped overboard, perhaps, after a shipboard feast. Then they came across the wondrous sight of other life forms unlike any ever seen before. The vents are so rich in life that it will be years before we have cataloged all of the species that live there. 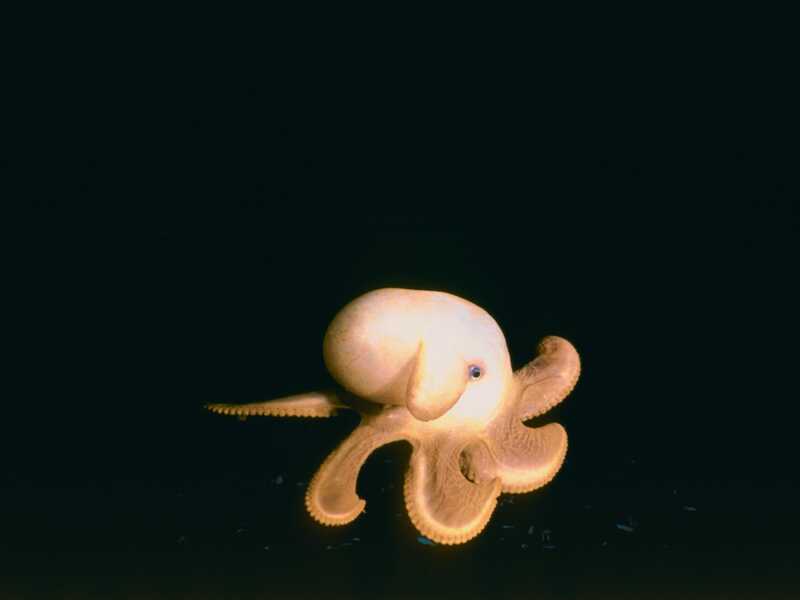 Over the past 20 years, new species have been discovered at the average rate of approximately one every week and a half. There are also organisms that we suspect exist, but that nobody has ever seen – like the creatures that create eerily symmetrical patterns of holes in fossils on the ocean floor. There are far too many amazing animals to describe here in detail – but here is a sampling of some of the creatures that appear in Volcanoes of the Deep Sea. Until a few years ago, no human being had any idea that any of these organisms existed. 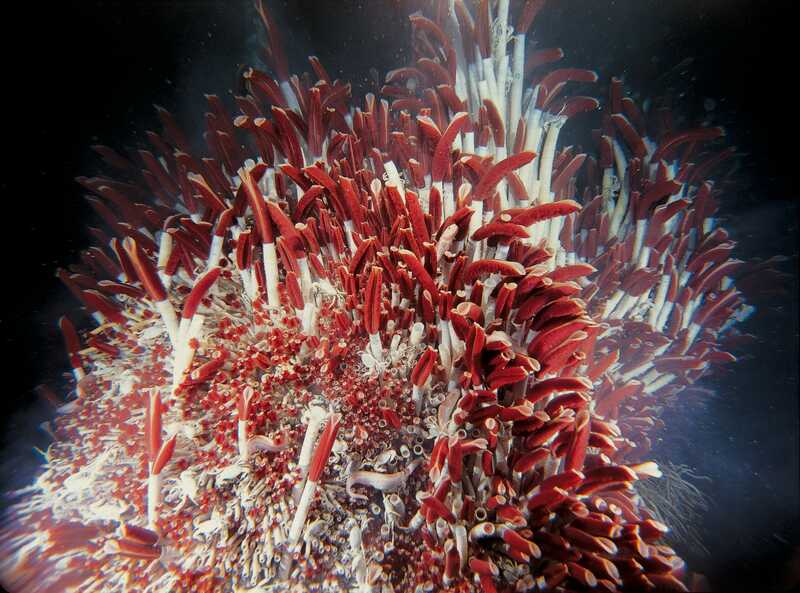 Giant Tubeworms: These awe-inspiring creatures are found in vent ecosystems in the Pacific Ocean. They live in strangely beautiful stands, where they grow to over 6 feet (1.8 meters) long. Not only are they big, but they grow fast, too – up to 2.8 feet (85 centimetres) per year! Tubeworms have a long, white body capped with a gorgeous red tip (the color comes from hemoglobin). With no mouth or digestive system, they survive in a symbiotic relationship with the bacteria living within them. In symbiotic systems, two organisms need each other to survive. The tubeworms provide an ideal environment for the bacteria, which, in turn, provide nutrients for the tubeworms. Vent Crabs: Several species of spindly-legged vent crabs live in both the Atlantic and Pacific. They are among the first species to arrive at new vents – though how they get there is a mystery. 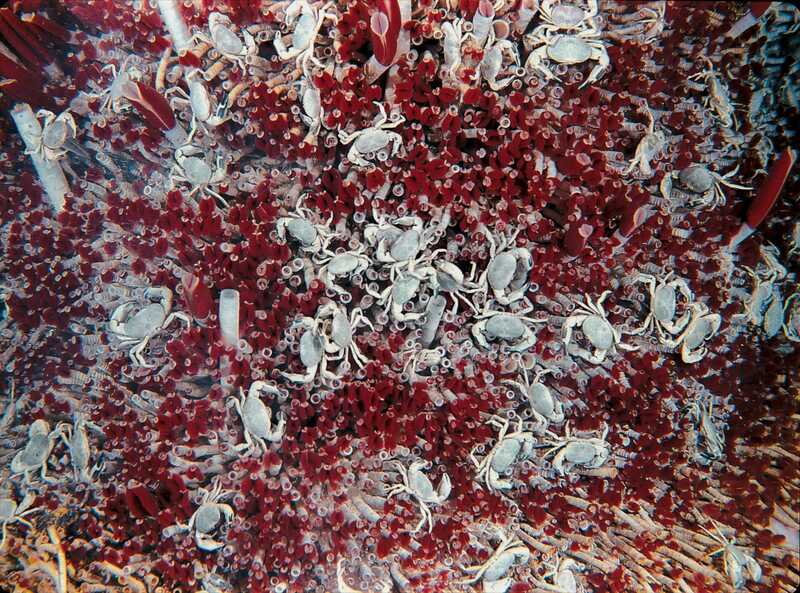 The first-ever vent expedition knew they were on to something completely new when they saw swarms of white crabs all around as they approached their first vent. The crabs are ravenous predators who will scoop up bacteria (growing on the ocean floor in mats so thick they are visible), take a nip off tubeworms, eat clams or scavenge whatever carrion they can find. Giant White Clams: Clams litter the ocean floor near many vent sites. But these are not the same types of clams you’re likely to find in a chowder. For one thing, they reek of hydrogen sulfide when brought to the surface. For another, each one can be as large as a dinner plate. Like the tubeworms, the clams live in a symbiotic relationship with bacteria. While they do have mouths, they don’t eat. Instead, they are nourished by the bacteria that live within them. Vent Shrimp: While most animals in the vent environment live at varying distances from the superheated water spewing from vents, shrimp thrive right near some of the hottest spots. They crawl around the rock near vent openings, where the concentrations of bacteria are highest. The bacteria grow on the shrimps’ backs, making for a convenient meal for neighboring shrimp. Millions of shrimp jockey for the prime, hydrogen sulfide-rich spots near the vents. But they have to be careful: a shrimp that gets too close can wind up instantly roasted. How do the vents change our understanding of life? The existence of an ecosystem based on chemosynthesis has overturned many assumptions about the nature of life – in particular, the idea that sunlight is essential for life to thrive. There is evidence that life on Earth may have originated in the vents, rather than in the upper reaches of the ocean. Even more exciting is the prospect of finding life elsewhere in the universe. It seems increasingly likely that life might exist elsewhere in our own solar system; here organisms resembling the chemosynthetic microbes at vents might exist, perhaps forming the base of complex food webs comprised of higher organisms. Lately, much attention has been focused on Europa, a frozen moon of Jupiter. Observations show that the ice covering the planet shifts, perhaps indicating the presence of water beneath the ice – and, possibly, of chemosynthetic-based life forms.